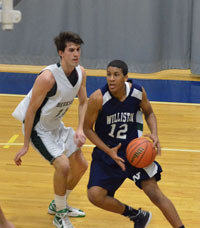 In Williston’s opening against Gunnery, Tyonne scored 11 points, grabbed 6 rebounds and had 2 steals to help Williston come from 12 points behind and secure a 65-57 victory. In Saturday home opener against Berkshire, Malone had a big game scoring 18 points and adding 11 rebounds, 3 steals and 3 assists helping the Wildcats earn a 62-54 victory. 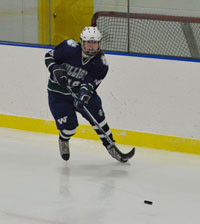 In the girls’ varsity hockey’s season opener against Millbrook, Defenseman Amanda Cronin played an outstanding game both defensively and offensively. Minutes after Millbrook put in their first goal of the game, Cronin countered with a quick step in the offensive zone and a low hard shot past the Millbrook goalie for the game winner. Cronin is a dedicated leader both on and off the ice. Sam has been a great addition to the wrestling team this year. Every day, he brings positive and energetic attitude that makes everyone around him work harder. Wrestling in a weight class above his actual weight on Saturday, Sam went a perfect 3-0 with 3 pins to help Williston to a 2-1 record on the day.